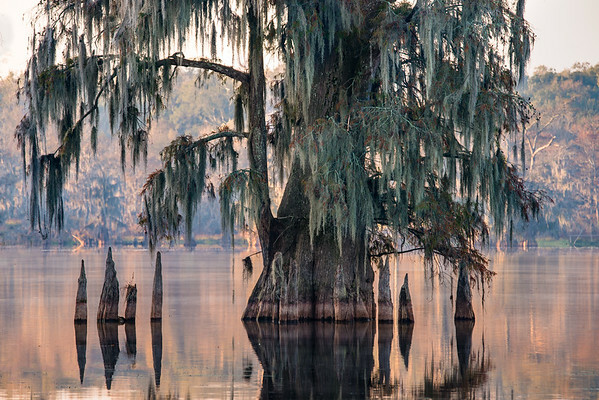 Cypress filled swamps have this mystical look which turns my photographs almost into paintings. One of the neat things about the "Bald Cypress" is that it loses its leaves in the winter. Perhaps more importantly for me, as a photographer, is the fact that its leaves *change colors* during autumn. The normally green leaves turn to orange, and red, and then eventually die, creating a sorta ghost-like creature of a tree. Now that I think of it, I sorta lied. The coolest part is that they live in swamps! Yes, *in* swamps. Willie, Carolyn and I arrived a day ahead of David and visited this particular lake on our own (thanks for the help David!). A group of photographers had arrived and were hopping in kayaks but we mostly just took photos from shore. As the sun started to come up it began to illuminate the trees on one side of the lake and the water started picking up some of that reflected light. I couldn't help but enjoy this tree, and all of the "knees" that stuck up out of the water (which are part of its root structure).